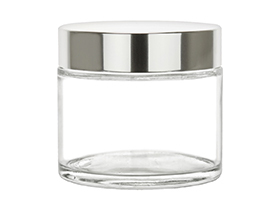 Our 220ml/7.4oz Glass Jar w/ Metalized Lid features a simple, yet elegant design that shows off your product without detracting from its natural beauty. The jar is made of durable glass with thick walls providing for a high quality feel while the matalized lid delivers a high end finish. Notify me when 220ml/7.4oz Glass Jar w/ Metalized Lid is in stock.